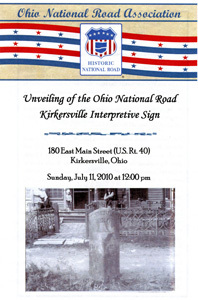 The fifth Ohio National Road Interpretive sign was unveiled on July 11, 2010. 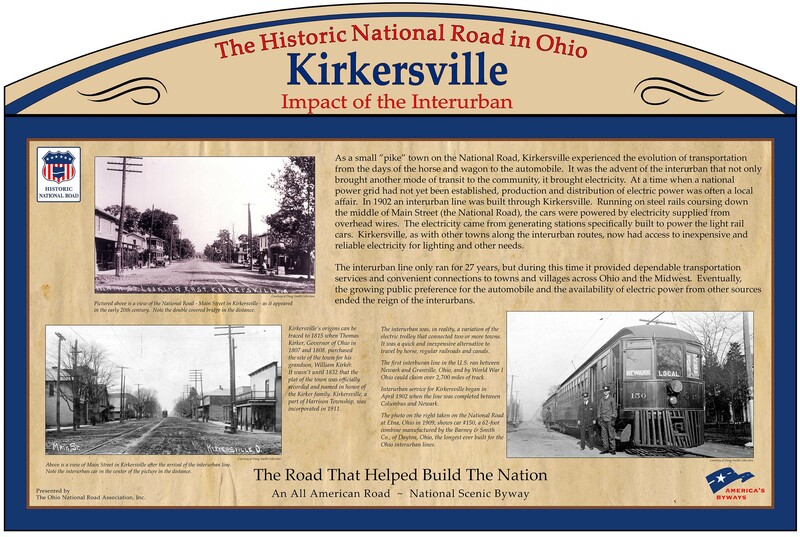 This sign, commemorating the history of the Village of Kirkersville, is located on the north side of the street, just east of the Kirkersville United Methodist Church at 180 East Main Street (U.S. Rt. 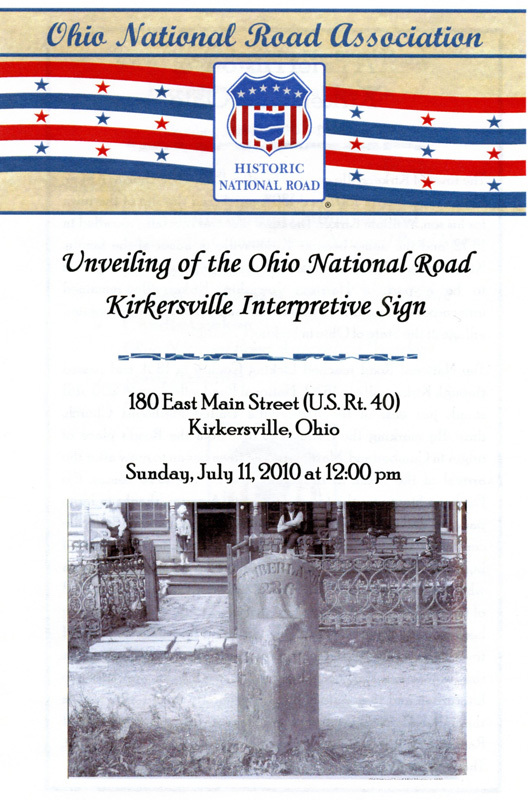 40) in Kirkersville, Ohio 43033. 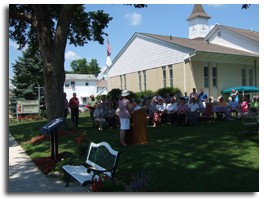 Many attendees participated in the Kirkersville United Methodist Church service prior to the unveiling. Pastor Richard Rothemich spoke briefly and then turned the microphone over to Licking County Commissioner and ONRA Vice President Doug Smith, who shared some history of Kirkersville, the National Road and his two historic quilts. A nice crowd gathered on the east lawn to witness the unveiling. 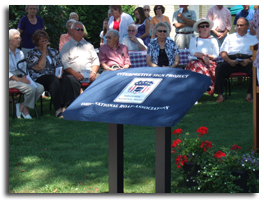 Ohio National Road Association President Cyndie Gerken spoke about the interpretive sign program and the importance of community involvement. 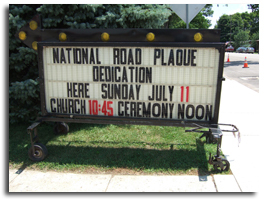 She thanked Doug Smith for sponsoring the sign and Kirkersville Mayor Terry Ashcraft for vacating the parking spaces in front of the sign and the National Road milestone. 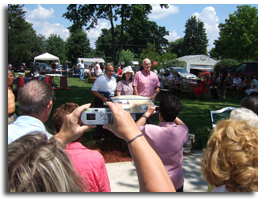 Licking County Commissioners Tim Bubb and Brad Feightner were recognized and their attendance was appreciated. The Kirkersville interpretive sign was unveiled by (left to right): ONRA Board member and Signage Committee Chair Mike Peppe, ONRA President Cyndie Gerken, and ONRA Vice President Doug Smith, the sign sponsor. 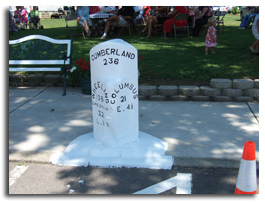 Located just east of the Kirkersville interpretive sign is National Road milestone 236, the number indicating the distance from Cumberland, Maryland where the National Road originated. 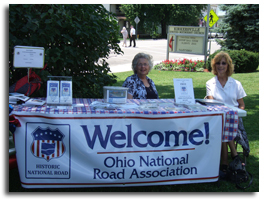 Manning the Ohio National Road information table were (left to right) ONRA Board members Denna Johnson and Mary Ellen Weingartner. Other Board members in attendance included: Cyndie Gerken, Mike Peppe, Doug Smith, Lynn Kartavich, Charla Devine and Larry Bicking. These historic turn-of-the-century community autograph quilts were discussed during the church service and were on display as part of the event. 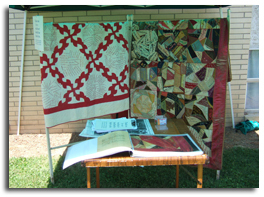 The 1896 “crazy quilt” on the right, was made by women of the Kirkersville United Methodist Church and all of their signatures are embroidered on the various quilt blocks.